Many patients believe the pain will go away on its own or they will try self-remedies before going to the doctor. A thorough history and physical is essential in making the diagnosis of plantar fasciitis. The time of the day the pain occurs, the patient’s activity level both at work and play, current shoe gear, the presence of sensory disturbance such as radiating pain, and the history of trauma are all important information to gather in your history. The lower extremity physical examination must include: range of motion of the foot and ankle, with particular consideration of decreased ankle dorsiflexion with the knee extended and/or flexed; architectural alignment of the foot; the angle and base of gait; palpation of the heel and plantar fascia; observation of swelling or atrophy of the fat pad; and the presence of any dysesthesia or hypoesthesias. Obtain weightbearing lateral radiographs of bilateral feet following a comprehensive lower extremity history and physical. An infracalcaneal spur is often linked with plantar fasciitis symptoms. Plantar heel spurs commonly imply that the condition has been present for at least six to 12 months, whether it is symptomatic or asymptomatic. Theoretically, the longer the duration of heel pain symptoms, the more prolonged period there will be for final resolution of the condition. 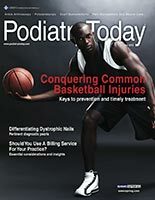 However, researchers have reported that more than 90 percent of patients respond to conservative measures.3 The most common cause of heel pain is plantar fasciitis yet the non-surgical treatment is not standardized.3 It is important to individualize treatment in order to resolve symptoms. At the University Foot and Ankle Institute, we looked at approximately 2,500 cases of plantar fasciitis in one year and followed those patients for a duration of five years. Initial treatments included habitual Achilles and plantar fascia stretching with regular sessions of home therapy or (preferably) formal physical therapy when the patient has the means to go to therapy three to four times per week. It is also helpful for patients to avoid flat shoes and barefoot walking with transition to the use of stiff soled shoes with a 1 to 1.5 inch heel, wear over-the-counter arch supports and heel cups versus custom orthotics, and restrict high-impact physical activities. In our patient population, we find patients recover with stretching, physical therapy, change of shoe gear, arch supports or custom orthotics, and modification of activity levels. Within six weeks of the initiation of treatment, we found our patients tended to report a decrease in symptoms and almost complete resolution of pain. If progression had occurred, initial therapy continued until symptoms had completely resolved. If pain continues to be present for over six weeks without much resolution, we perform a cortisone injection under ultrasound guidance to try to resolve any residual swelling. We prefer not to perform multiple injections as they do not seem to make a significant difference if the first injection does not adequately resolve the swelling and pain. Can PRP And ESWT Be Effective For More Chronic And Thickened Fascia? If symptoms continue and patients do not report progress within three to six months, our next line of treatment includes platelet rich plasma (PRP) injection or extracorporeal shockwave therapy (ESWT) for the more chronic and thickened fascia. It is our belief that after a period of three to six months, the plantar fascia no longer has adequate blood supply for healing and is more of a plantar fasciosis case than a plantar fasciitis case. In such cases, increasing the blood supply to the damaged region may better resolve the chronic pain. Platelet-rich plasma is an autologous, biological, blood-derived product, which one can exogenously apply to a variety of tissues. The PRP releases high concentrations of platelet-derived growth factors that enhance wound, bone and tendon healing. Growth factors release when the platelets become activated, subsequently initiating the body’s natural healing response.4 Platelet-rich therapy is safe and the technique does not impair the biomechanical function of the foot. The patient may wear a short controlled ankle motion (CAM) boot walker for approximately two weeks after PRP injection to allow the body’s inflammatory response to heal the thickened, scarred fascia. Often, a second injection is required in severely thickened and damaged plantar fascias. An alternative to PRP is ESWT. Shockwave has a similar mechanism of action as PRP and can initiate an inflammatory response. Shockwave requires no period of immobilization, providing patients with an immediate return to work and resumption of full activities within two to three weeks. Weil and colleagues found electrohydraulic ESWT to be as effective for chronic plantar fasciitis as a percutaneous plantar fasciotomy.5 We will perform ESWT with a low-energy machine at 10-day intervals and have found three treatments to be optimal. We tell patients to limit activity and rest the treatment region after each procedure to allow the healing factors of the body to work optimally on the damaged fascia. Surgical treatment, whether it be Topaz (Arthrocare) or an open release, is our last resort for patients with moderate to severe, persistent symptoms that have been resistant to at least six months of non-surgical therapy. We have found that less than 5 percent of our plantar fasciitis cases make it to the operating room. Surgical procedure alternatives for recalcitrant plantar fasciitis include: isolated partial or complete release of the plantar fascia or a fascial release in combination with a nerve decompression; calcaneal spur resection; or excision of abnormal tissue. Surgeons may perform these as either open or endoscopic procedures, both of which have advantages and disadvantages. The most common surgical procedures that we perform in our office include the Topaz and endoscopic plantar fasciotomy. Topaz Coblation is an alternative procedure to the endoscopic plantar fasciotomy that we find successful in our hands. It is a quick, straightforward and minimally invasive technique associated with patients’ speedy return to their daily activities. With this percutaneous procedure, one makes approximately 20 to 25 holes with a needle through the skin to the level of the plantar fascia in a grid pattern. Introduce the Topaz probe and release a Coblation energy force in each hole location, breaking up the scar tissue and increasing vascularity to the plantar fascia region. Topaz procedures have also been associated with increased strength in the plantar fascia insertion and decreased small nerve fiber pain in the region of the plantar fascia insertion. After using Topaz Coblation, we emphasize immobilization for one week with crutches and a CAM walker. The patient would subsequently have three to four weeks of passive and active range of motion exercises. We perform endoscopic plantar fasciotomy via a single minimally invasive incision on the medial aspect of the heel. We then introduce a camera that has a blade mounted on the end and release the medial and central bands of the plantar fascia in their entirety. Patients are non-weightbearing for one week on crutches followed by weightbearing as tolerated in a CAM walker boot for an additional week before progressing to regular shoe gear. Possible complications that can occur with open or endoscopic procedures include but are not limited to: persistent or recurrent pain; arch collapse; injury to the posterior tibial nerve; and complex regional pain syndrome. The perceived advantages of endoscopic techniques are a more rapid recovery and quicker return to activity following surgery. Our practice has been following an algorithm for the treatment of plantar fasciitis with relatively great results and patient satisfaction. We have seen an almost complete resolution of pain and symptoms without the need for surgery in over 95 percent of our patients. The main advance has been to differentiate the treatments for plantar fasciitis and plantar fasciosis. After making a diagnosis of plantar fasciitis, our patients start physical therapy and receive instructions to perform daily home stretching exercises. We emphasize supplementing therapy with supportive shoe gear and arch supports. If these modalities fail to relieve the symptoms, we attempt cortisone injections. If pain continues, a change of course to plantar fasciosis treatment starts and we initiate PRP or ESWT depending on the level of scar tissue and the length of time the symptoms have been present. Surgical intervention, whether it be Topaz Coblation or endoscopic plantar fasciotomy, is always the last step and we have found that it seldom comes to this after following the algorithm we have presented. 1. Ogden J, Alvarez R, Marlow M. Shockwave therapy for chronic proximal plantar fasciitis: a meta-analysis. Foot Ankle Int. 2002; 23(4):301-308. 2. Thomas JL, Christensen JC, Kravitz SR, et al. The diagnosis and treatment of heel pain: a clinical practice guideline-revision 2010. J Foot Ankle Surg. 2010; 49(3Suppl):S1-S19. 3. Barry L, Barry A, Chen Y. A retrospective study of standing gastrocnemius-soleus stretching versus night splinting in the treatment of plantar fasciitis. J Foot Ankle Surg. 2002; 41(4):221-227. 4. Peerbooms JC, van Laar W, Faber F, et al. Use of platelet rich plasma to treat plantar fasciitis: design of a multi center randomized controlled trial. BMC Musculoskelet Dis. 2010; 11:69. 5. Weil L, Roukis T, Weil L, Borrelli A. Extracorporeal shock wave therapy for the treatment of chronic plantar fasciitis: indications, protocol, intermediate results, and a comparison of results to fasciotomy. J Foot Ankle Surg. 2002; 41(3):166-172.